The 2018 Mazda CX-9 comes in for various upgrades in its second year on the market, including new safety features. For 2018, the CX-9 comes with the automaker’s Smart City Brake Support, which is essentially a forward collision system that can apply the brakes in an emergency situation below 19 miles per hour as standard. With the new technology, the CX-9 joins the Mazda3, CX-3, and CX-5 in offering the system as standard equipment. In addition to the forward collision system, the CX-9 also gets blind-spot monitoring with rear cross-traffic alert as standard, as well. The CX-9 is already one of the Insurance Institute for Highway Safety's Top Safety Pick Plus for midsize SUVs, but only if it's a properly equipped Grand Touring or Signature model. The new standard features should elevate even the base model to TSP+ status. Furthermore, the CX-9 also gets the automaker’s G-Vectoring Control, which alters the SUV’s steering feel by reducing the amount of torque the engine is putting out, resulting in more weight being put onto the front wheels. 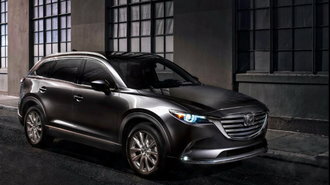 “Families trust us to build vehicles that not only surprise and delight with how they drive but also with the engineering excellence that goes into making them, showing that there’s no need to compromise between needs and wants in a seven-passenger people-hauler,” said Tetsu Nakazawa, CX-9 vehicle line manager, Mazda North American Operations. Pricing for the 2018 CX-9 has increased by $610, as the new Sport trim with front-wheel drive costs $33,070 with the $940 destination fee. That feels like a reasonable increase for a spacious, fun-to-drive crossover with so much standard safety technology. The 2018 CX-9 will go on sale later this month. Is The 2016 Mazda CX-9 Right For You?